The C.D. 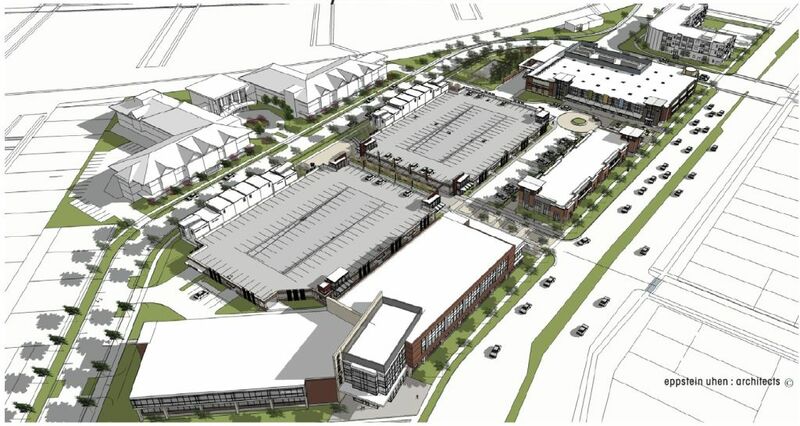 Smith Construction/Eppstein Uhen Architects proposal includes a plan for a grocery store. EUA also designed the Goodman Community Center. In an email to City of Madison officials C.D. Smith Vice-President Mike Krolczyk said the firm was withdrawing their proposal for Union Corners due to “specific market conditions” and other opportunities they were pursuing. C.D. Smith partnered with Eppstein Uhen Architects (EUA) on their proposal which included a grocery store as part of the retail component of the site, however the plan did not depart much from a 2004 plan that failed before ground was ever broken. EUA has history in the neighborhood as just over the hill to the east of Union Corners is the recently redesigned Goodman Community Center, which was an EUA project. Union Corners had been dying a slow death for decades as businesses struggled to exist on that corner and Ray-O-Vac’s manufacturing plant faded away. In 2010 the city purchased the site for $3.57 million and issued an RFP in June. The remaining proposals vary in cost, topping out at $108 million with public assistance requests as much as $15 million, which the Mayor said may be difficult to provide. With C.D. Smith / EUA dropping out only the team of Livesey / Stonehouse remains to present to the Union Corners Committee which will take place August 29. A public hearing on the four active proposals is on September 12, 2012 at 5 p.m at the Madison Senior Center. This entry was posted in Madison, Madison Commentary, Willy Street, Willy Street Commentary and tagged C.D. Smith Construction, City of Madison, Community By Design, EPINC, Eppstein Uhen Architects, Gorman & Company, Livesey Co, Mayor Paul Soglin, SASYNA, Stone House Development, Union Corners, Union Corners Committee by TheEastSider. Bookmark the permalink.